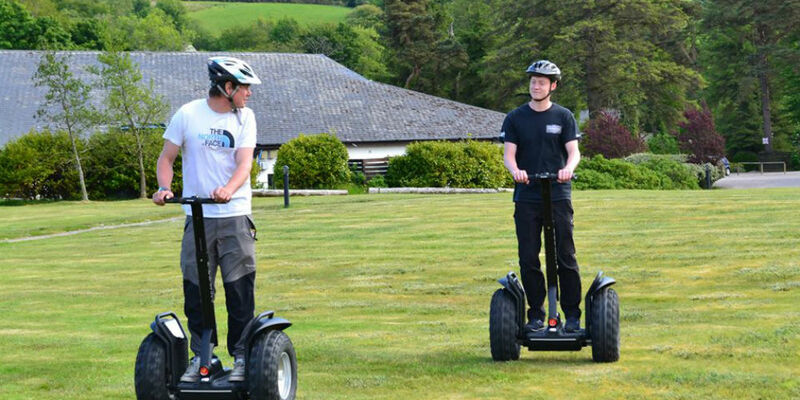 We have Arran’s only fleet of Segway X2’s; these rugged yet easy to manage off-road machines are the best segways available. The machines have 5 inbuilt gyroscopes, 2 accelerometers and motors that work to keep itself upright and balanced, very technical and very clever which make them a unique experience to travel on. Our sessions include 10 minutes familiarisation and 40 minutes touring Glen Cloy. Don;t worry if you don’t pick it up right away as we’ll give you all the instruction you need; and, of course you’ll be escorted by an instructor at all times. We can offer segway sessions for individuals, couples, families and groups – from ages 10 years (subject to weight limitations) and older. Available at regular intervals throughout the day. Please contact the Arran Adventure team directly to enquire. You will find us the Arran adventure centre at the back of Auchrannie Resort. Take the first road on the right when you come into Auchrannie grounds.